Univac’s pumping system is designed to produce a contaminant free environment for the process along with high speed pumping performance. Full automation of system pumpdown is via PC based controller with mimic diagram and system status massage displays. Full manual override by keypad selection is also provided for maintenance functions. Our diffusion pumps, manufactured from long experiences and technologies, feature the excellent throughput compared with those of other makers. They assure the stabilized performances even in the long mass production operation, which attribute to the optimal zet nozzle design, the excellent cooling capability and the stable function of the heaters. The pump is controlled by the system control program with the real-time check for the present status. 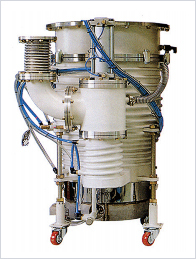 The operation principles of the Cryogenic Pump lie in the reduction of the interior temperature of the pump to 10K and the reduction of the number of molecules in free motion within the vacuum chamber by the condensation and sorption of vapor molecules. 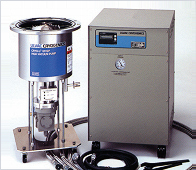 Clean vacuum can be maintained as no oil is used. The more excellent throughput of the pump than any other high vacuum pump ensures the wide use in the process of the optical industry requiring high cleanness. 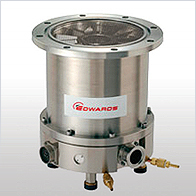 Turbomolecular(turbo) pumps are very clean mechanical compression pumps. They pump by using a highspeed rotating surface to give momenturn and direction to gas molecules. They operate smoothly and contribute little vibration to the operating system.